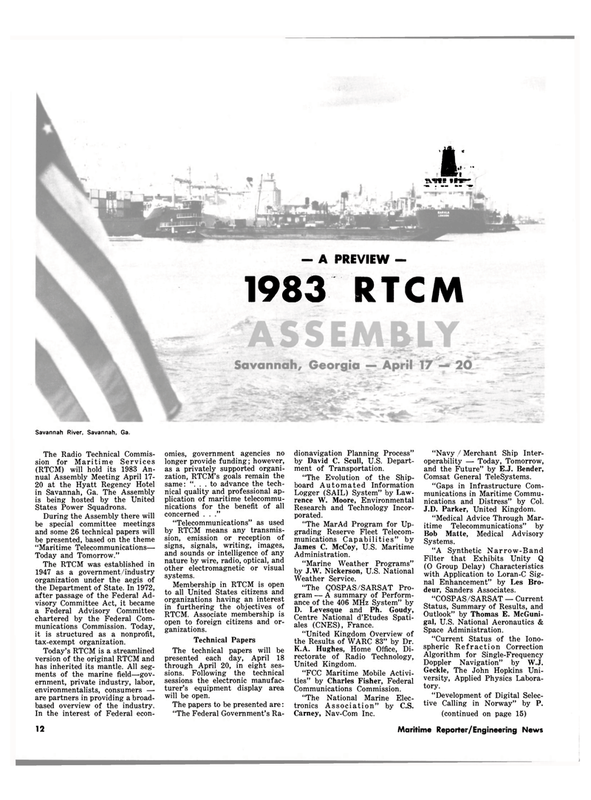 The RTCM was established in 1947 as a government/industry organization under the aegis of the Department of State. In 1972, after passage of the Federal Ad- visory Committee Act, it became a Federal Advisory Committee chartered by the Federal Com- munications Commission. Today, it is structured as a nonprofit, tax-exempt organization. Today's RTCM is a streamlined version of the original RTCM and has inherited its mantle. All seg- ments of the marine field—gov- ernment, private industry, labor, environmentalists, consumers — are partners in providing a broad- based overview of the industry. In the interest of Federal econ- omies, government agencies no longer provide funding; however, as a privately supported organi- zation, RTCM's goals remain the same: ". . . to advance the tech- nical quality and professional ap- plication of maritime telecommu- nications for the benefit of all concerned . . ." "Telecommunications" as used by RTCM means any transmis- sion, emission or reception of signs, signals, writing, images, and sounds or intelligence of any nature by wire, radio, optical, and other electromagnetic or visual systems. RTCM. Associate membership is open to foreign citizens and or- ganizations. The technical papers will be presented each day, April 18 through April 20, in eight ses- sions. Following the technical sessions the electronic manufac- turer's equipment display area will be open. Centre National d'Etudes Spati- ales (CNES), France. "United Kingdom Overview of the Results of WARC 83" by Dr.
Communications Commission. "The National Marine Elec- tronics Association" by C.S. Comsat General TeleSystems. "Gaps in Infrastructure Com- munications in Maritime Commu- nications and Distress" by Col.